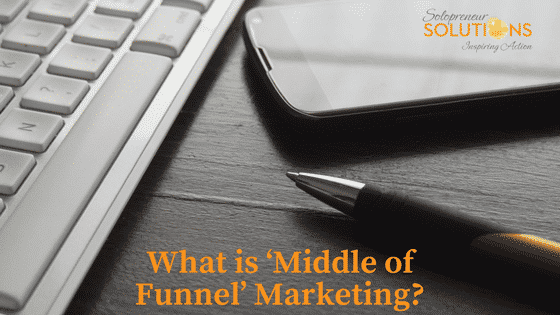 What is ‘Middle of Funnel’ Marketing? Reaching your target audience is simply the tip of the iceberg when your goal is to make them a lifelong customer. Marketing strategies are numerous during the top of the funnel marketing campaign. Once a consumer is aware of your brand and services or products you offer, their interest transitions them into the most imperative part of the “marketing funnel,” which is the middle. A well thought out middle of funnel strategy will make the transition from interested and aware, as outlined in the top of the funnel, to sold and satisfied, which is the ultimate goal of the bottom of the funnel. How Do I Plan Middle of Funnel Strategies? In order to develop a strong middle of funnel campaign, it is imperative to understand the purpose and components that set the top, middle, and bottom apart. First, the main goal of the top of the funnel is to bring awareness and interest in your brand, products, or services to as many consumers as possible. During this time, you must accept that you will not meet the needs or desires of every person that comes across the information or advertisements you employ. The transition to middle of funnel marketing depends on letting go of those not ready to move forward, and engaging customers who express interest. Strategies utilized must develop the transition from awareness to engagement. The main task is to get to the bottom of the funnel, where there is a sale and the ultimate goal is accomplished. This step in the buying process can be complicated and difficult, but certainly not impossible. Middle of funnel marketing must address overcoming objections and avoiding fallout, setting yourself apart from the competition, and building relationships to create customer buy-in. Every industry can adapt these principles to accomplish the movement of the most leads through the process. The first component to prioritize in middle of funnel marketing is guiding the consumer from awareness to trust. People have a need and are seeking a service or product to fit that need. Now that they know you can help them, it is important to set your product or services apart from the competition and show the quality of what you have to offer. For a large company, this can be challenging, as you want to match customers with the best consultant or team to create a bond and build relationships. At this stage, value ads can show how what you have to offer will exceed their expectations. Customer buy-in is imperative to avoid fall out. Follow ups and incentives can be utilized in middle of funnel marketing to keep consumers on the path to their purchase. During this transition, keep in mind that the consumer is still deciding. Everyone is different, and there isn’t a one-size-fits-all plan for the movement from the top of the funnel to the bottom. What can you or your company do or provide that is more beneficial than what someone else has to offer? Building an understanding of value in your product and services puts the customer at ease and reinforces their decision to explore this option. Depending on your industry, the consumer may need days or weeks to move from awareness to commitment. Not only does your strategy need to establish trust, but also cultivate the bond to your brand. Focusing on accomplishing the customers goal by providing options, advantages, and addressing limitations opens the door for a smooth process from beginning to end. At this stage, setting realistic expectations and utilizing resources will play in your favor. Now more than ever, providing education and helpful information can build the relationship and put the customer at ease. Don’t assume what they know or don’t know, and employ marketing geared toward education and a better understanding of your brand. Another aspect to keep in mind during the middle of funnel marketing outreach, is there will be fall out. The concept of a funnel is that it starts very large at the top, and gradually tapers down. In the middle you want to avoid fall out, but also be aware that time and resources must focus on getting the most leads from the top of the funnel to the completion of the sale at the bottom. Streamlining the process takes consistency, and self-evaluation. To accurately assess middle of funnel success, you must track conversions and evaluate strategies. Look at what consumers respond to and put time and resources into improving those tactics. When looking at follow up, what means of communication provokes the most responses? A large component of middle of funnel success comes down to checking in on what works, and more importantly, what isn’t working. Avoid sinking more resources into less desirable designs. Overall, middle of funnel marketing strategies and concepts are worth as much, if not more, than top and bottom master plans. As you employ a game plan to transition a consumer from interested to sold, utilize and build on the top of funnel outreach that peaked their interest. Continue to grow their awareness into a trusting relationship. By setting your goods and services apart, you will avoid fall out and create buy-in from the consumer. Walk alongside them as they are making the decision and show them how your options best meet their needs and accomplish their goals. Evaluate what works and doesn’t work as you refine this step in the process. Before you know it, the sale will be forthcoming, and you will move into having a customer for life. What middle of funnel strategies have worked best for you? Why not share them, and your success stories, in the comments below so our readers can learn from your experiences? What is Top of Funnel Marketing? What is ‘Bottom of the Funnel’ Marketing?